Totally private 'Perfect Hideaway Studio' with spectacular views! Our studio apartment has a canava double bedroom (traditional Santorinian room- cave), a smartly decorated and comfortable living room with a fully equipped kitchenette to accommodate your romantic meals and most importantly an exclusive, very large private balcony overlooking the volcano and the unique breathtaking sunset views allowing you to embrace the beauty of this magical place! Finding such a large private balcony as well as such a high degree of privacy is very rare on the caldera of Oia! This romantic Studio is just Perfect for Honeymooners and all couples seeking privacy and romance. At the same time as being extremely private and quiet, it is also situated on one of the main paths of the village of Oia, right next to everything! The Perfect Hideaway Studio is a great deal! It is a perfect hideaway for couples that value style and privacy! 'Lucky Homes Oia', is a complex of three beautiful and cozy homes, newly renovated traditional 'captain’s houses' situated right in the heart of the beautiful village of Oia overlooking the Volcanic islands of the Caldera basin. Their unique architecture has been respectfully preserved making them truly unique. 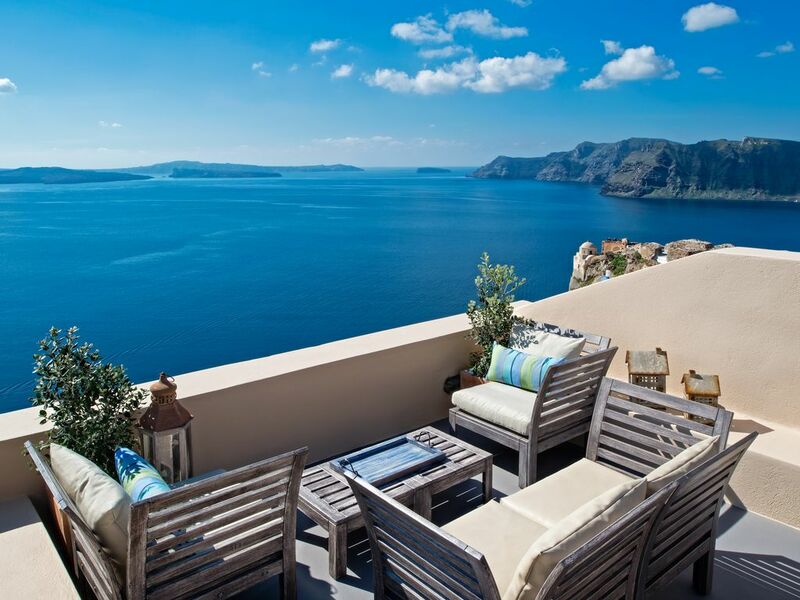 They offer fantastic views of the Volcano, the Caldera of Oia, the island of Thirassia and the Aegean Sea! The Perfect Hideaway Studio, Oia Home I and Oia Home II are three Lucky Homes that will turn your holiday into an unforgettable experience! Lucky Homes Oia are 2 min walking from the Post Office and the Municipality of Oia right in the centre of Oia, and next to beautiful little shops, nice restaurants and mini markets. They are situated on a main path of the village therefore there are no tiresome steps for the visitor. The location is ideal as it is central but quiet at the same time! The view from the veranda is spectacular! The guests can use the full kitchen to prepare delicious meals and enjoy them at the dinner table of the veranda, enjoying the unique view that the house offers! There is nothing like enjoying a santorinian quality wine along with good friends and loved ones while watching the view of the caldera at night!! Having your coffee on the veranda while watching the sunrise colors of the caldera and enjoying the silence of the scenery is an unforgettable experience! We will welcome you to the house & help you make a plan for your stay. We will give you suggestions for things to do and places to see, restaurants and everything else that we may think you may want to do! We can arrange everything for you from car rental to sea kayaking and diving! We live on the isalnd and absolutely love it so we will try to make you love it too! The Studio has a small kitchenette that is equipped with electric stoves and cooking utensils. Large Private terrace with one of the best views on the island!! We love the property and the decor. Has a magnificent view of the caldera. The house is just few steps to the Kastro Walls where people go to watch the famous sunset. Close to a lot of shops and restaurants as well.Shops and restaurants are open till past 12 MN. Walked down 200+ steps to Amoudi Bay ,which was gorgeous and has good restaurants .Bus transportation very accessible .Fira only 20 min. away by bus.Our host, Kryiakos drove us for sight seeing for a day and took us to Psaraki restaurant- which has the best seafood ever. Kryiakos was an excellent and super host . We love him. Thank you so much Kyriakos. The best part of the house was the balcony,we couldn't get enough of that caldera view.We hanged out every night on the balcony drinking wine and watching tourists passed by.The bathroom upstairs was small, needs towel hooks but all in all , we love the property a whole lot. My Family and I stayed at this property in OIA for two nights and the experience was increable. The property was very clean, cozy and it had a spectacular view. We rented the 3 properties and we were very confortable. I highly recommend this property if you're planning a trip to Santorini. Tania was very helpful thru the whole process. This was my first time renting a home in a foregien country using VRBO and she was great in all aspect. Very professional. I didn't have the pleasure to meet her in person but we were welcomed by her business partner, Kyriskos who was also very helpful. Our luggages were taken to and from the property from the Post Office which it was our point of meeting at arrival and departure. This trip to Santorini has been my dream for a few years and it was more than I expected. OIA is a very magical place, too beautiful to be real. This home is way better than the pictures (and the pictures are gorgeous) but you cannot fully appreciate the view until you are there. It was so nice, one day we couldn't pull ourselves away and we just sat on that patio and took it all in all day! Kyriakos helped us through our stay and was the best! He was beyond helpful and so nice! The panoramic, fantastic sea view and volcano scenery are in front of your private, quiet balcony, lay back on the chairs, watch the calm ocean and the splendid blue sky, and of course enjoy the sunshine is one thing you will never get tired of, you can see the famous Oia Sunset few steps from the studio, fine restaurants, cafes are right around the corner. It is really A PERFECT HIDEAWAY PLACE, we enjoyed time staying here very much. Lucky Homes Oia are 4 minutes walk from the Post Office and the Municipality of Oia right in the centre of the village, and 2 minute walk to shops, nice restaurants and mini markets. Right at the corner of the main path where Lucky Homes are situated is found the famous Oia Fortress, the spot where everyone sees the sunset! The location of the houses is very convenient as it is really central in the village and it is found at one of the main paths, therefore there are no steps to reach the houses! The view from all three balconies of the Santorini's caldera, the famous volcano and the island of Thirassia is truly breathtaking and unforgettable! Daily maid service is included in the above rates. Cancellation Policy: In the event of cancellation 21 days or more prior to arrival we will refund your deposit in full. In the event of cancellation 21 or less days before your arrival we will charge 50% of the total agreed amount, in accordance with the Greek Law.